Using a knitting loom is a wonderful way to teach a youngster how to "knit" without the frustration that sometimes comes from trying to manipulate the needles. These looms are also great for older or more experienced crafters who want to try something different, but similar to traditional knitting. Depending on the particular project that you choose, there are two basic loom shapes to choose from: Round and rectangular. 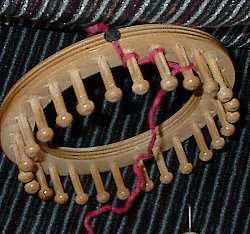 These looms are circular shaped with pegs all around the outside. They are perfect for making any tubular object like a hat or bag. These looms come in multiple sizes. These looms also come in a variety of sizes and are considered multi-purpose looms. They can be used to make tubular objects like the round looms, but can also be used to make a solid piece of fabric for things like scarves and afghans. 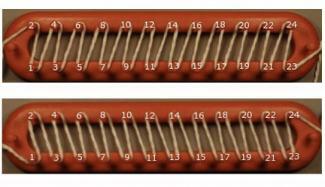 The basic method for loom knitting uses an e-wrap stitch and is perfect for creating tubular pieces on any style loom. Tie a slipknot and put it over the first peg of the loom. 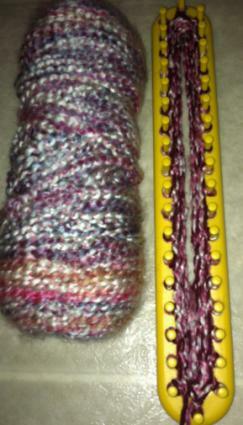 Wrap the yarn around the next peg loosely in a clockwise direction. Continue around the loom wrapping each peg. Go around a second time and put a second wrap on each peg. Use the loom knit tool to pull the bottom loop over the top loop and off the peg for every peg. Repeat this process until the piece is the desired length. The zig zag method is the best way to create a solid piece of fabric. This style works only with a rectangular or long loom. Place a slipknot over the first peg. Wrap the yarn around the peg opposite to the first peg using the same e-wrap method as the basic stitch. Come across the loom diagonally and wrap the second peg on the first side of the loom. Continue wrapping in a zigzag pattern until you reach the end of the loom. On the last peg, do a second wrap and turn around. Repeat the zig zag pattern going the other way. When you reach the end, pull the bottom loops over the top and off the pegs. Repeat until your piece is the desired length. You can also do a variety of fancy stitches and patterns using a knitting loom. These stitches can help create a border on your work, weave delicate pieces into a larger work, or just add a unique touch to any project you complete. Complete one last row as normal. Cut the yarn off leaving a tail twice as long as the width of your piece. Thread a darning needle onto the tail. Pull the needle through each loop on every peg. 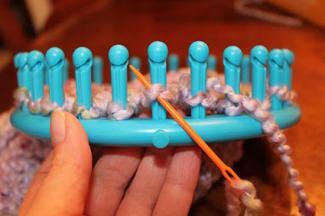 When you reach the end, use the knitting tool to pull each loop off the pegs. If you are knitting a solid piece or an open tube tie the yarn off and cut the tail. If you are knitting a tube that you want to close, pull the yarn to tighten the loops together and then tie off the yarn and cut the tail. Always keep your knitting loose. Tight wraps make it very hard to pull loops off the pegs. Knit with thick yarn, or two strands of thin yard together, for best results. If you use a single strand of thin yarn, your piece will have a mesh look. Make several squares of solid knitting and sew them together to make afghans and larger pieces. A lot of people really enjoy knitting on a loom because it seems to go faster than knitting with needles. Once you get the hang of the loom, you will be whipping out projects in no time.